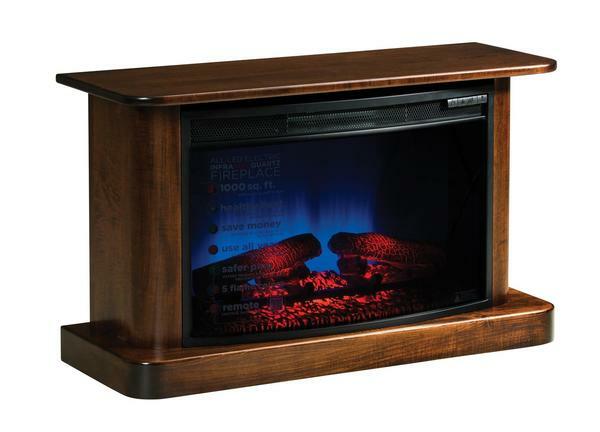 Warm up next to the ones you love with this Amish made, LED fireplace. The cabinet frame is handcrafted from your choice of solid wood, including classics like Red Oak, Brown Maple, Quarter Sawn White Oak, and Cherry in addition to unique Sap Cherry and Grey Elm. Select a finish to complement the rest of your living or bedroom furniture. Control the temperature in the room from your favorite spot on the sofa. Enjoy the warmth of an Amish made electric fireplace and avoid dealing with smoke, ashes, and fireplace clean up. Please don't hesitate to contact us at 1-866-272-6773 with any questions or visit our Amish furniture store in Sarasota, Florida. We look forward to customizing solid wood, made-in-America furniture for your home or office.